Are you pitching a new idea to potential investors? Looking for new clients? Deepening relationships with existing customers? Negotiating the terms of a deal? Going on a book tour? Speaking at an industry conference? Is there an upcoming presentation you want to nail? Or do you want to be more effective day to day and develop executive presence? In today's competitive business environment the ability to deliver a powerful presentation is a necessity and a differentiator. Excellent presentation skills are a competitive edge! We've all seen it happen---the better presenter get his/her ideas accepted, gets more budget or staff, and gets the recognition or even the promotion. 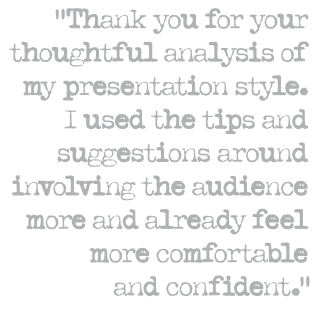 What would it mean to your career if you were consistently able to deliver a presentation that WOWED every audience? Being brilliant, being likeable and having fun presenting are not mutually exclusive. Whether you love to be on stage or you are terrified, here is something to consider. Great content with poor delivery can get you on first base. With great delivery and poor content you often get to second base. And you CAN hit a home run when your delivery and content come together. Why not enhance every presentation, leverage your unique attributes and enjoy the ride? And, it doesn't take much time to see a huge difference. Build your confidence and watch dramatic results happen. Do you see people nod off, look bored, or tune out when you are presenting? Unproductive meetings and boring PowerPoint presentations waste everyone's time. Do you worry, wait and wing it? Why not practice, polish it and punch it up, instead? The key to success and enjoyment is audience engagement. Are you using stories, analogies and metaphors to make an emotional connection with your audience or are you more blahblah blah CHART blah blahblah STATISTIC blahblahblah DATA? Presentation design starts with knowing your audience, their objective and your objective. Then you design the content, using a full tool box, and finally, deliver a MEMORABLE presentation with engaging techniques. Wouldn't you love to stand up and deliver something that is fun, compelling, appealing and exciting like all those other cool speakers? Why not have a presentation people enjoy and talk about and one that you actually like delivering? I've worked with thousands who feel the fear just like you. As one client said, "Ignore this at your own peril." Yes, you can transform your public speaking anxiety and actually look forward to the opportunity. And, if you are already good, let's take your skills, polish them and move to the next level. We will work together, one on one or in a group on your speech or presentation to make it more memorable and exciting, while keeping it in "your voice". It's time to shine and exceed expectations every time. Be SEEN. Be HEARD. Be MEMORABLE. ENJOY. Balance gravitas and humor. Can skillful presentation tools make a difference in your life? Take the next step. Let's have some fun and see new results. Call me at 212 874 1201.